We're backing Warrington Wolves to reach the final! Home > News > Uncategorized > We’re backing Warrington Wolves to reach the final! We’re backing Warrington Wolves to reach the final! 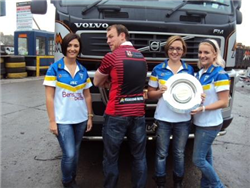 Maxilead Metals are glad to announce they are sponsors of last years league leaders, Warrington Wolves. There first match of the season see them take on Hull FC on Sunday 5th February. Followed by a home tie against London Broncos on Sunday 12th February. Local lad Mickey Higham who joined the Wolves in 2009, payed us a visit to unveil this seasons shirt. It was a pleasure to welcome him to the yard, and show him around. We wish the full team at Warrington Wolves lots of luck for the 2012 season and hope to see them get to the cup final carrying the Maxilead Metals name on their backs!